My father really enjoys porters. Generally, they are slightly sweeter, not as roasty and dry as a stouts. The history of porters is also pretty interesting. The first “industrialized” beer, porter provided much of the calories needed for the working class of London during the industrial revolution. Stouts grew out of these beers, and has now mostly replaced them. There is a terrific chapter on porters in Randy Mosher’s Radical Brewing and would highly recommend this book to anyone who wants to learn more. 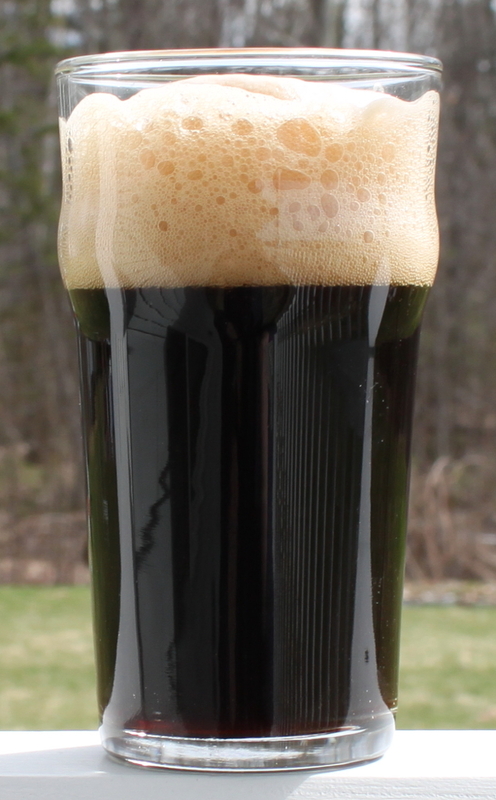 Anyway, I decided to brew a porter for when my father came up last summer. My older son has taken to calling my father “Gramps”. Not sure why, he just likes saying it, so it stuck, and hence the name of the brew. Now, one of the other favorite beverages of my father’s (and yes, mine too) is single malt whiskey. So, I decided to do a smoked porter, using peat smoked malt, adding a flavor found in some of our favorite single malts. Smoked porters are nothing new, there are several good versions you can get. Stone brewing makes one, as does Alaskan brewing. However, in mine, I wanted to keep the smoke as a background note, not the dominant flavor. It is easy to overdo it on the smoked malt, so I figured for this brew, I would start on the lower side, and go from there. I also really enjoy molasses in my porters. In college, I tried brewing “Goat Scrotum Porter” from Charlie Papazian’s the Joy of Homebrewing. No I did not make that up, that is really the name of the recipe in the book, and it makes a damn fine porter. Molasses, brown sugar, and bakers chocolate all ended up in that beer in college, and since then, I have pretty much always tossed molasses into my porters, in homage to the book that got my hooked on this hobby. Tasting: Very carbonated, I overshot this one a bit. However, there is a nice tan color to the head, with a very dark brown almost black, red highlights to the light. On the nose, the peat is there, but it is in balance with with dark chocolate and liquorice notes. The taste has a slight bite at first, I think from the carbonation, transitioning to some cherry esters and a very smooth roasted malt, with a slight sweetness and smokiness at the end. The body is pretty middle of the road. 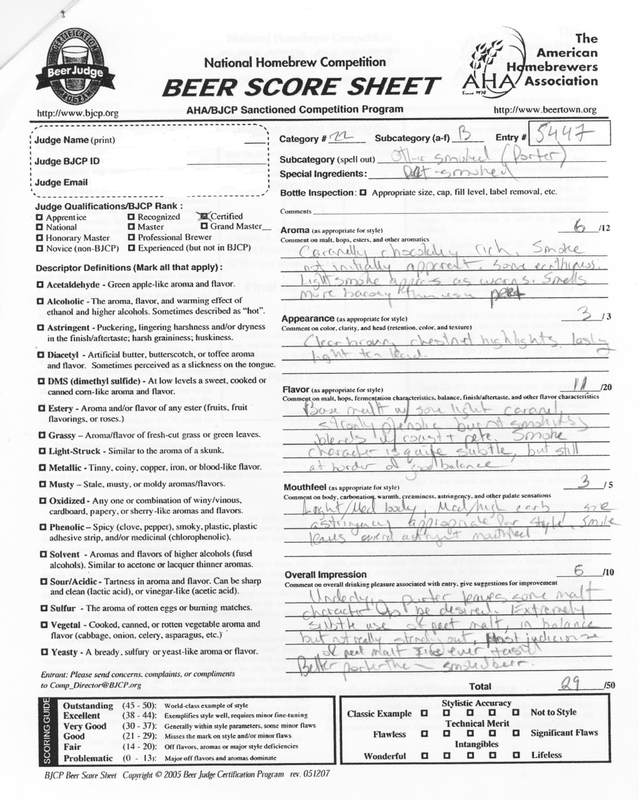 Critique: I am pleased with this brew. It is pretty much what I was going for, and find it every easy to drink and enjoy it every time I open a bottle. The beer is 1 year out (I still have 4 bottles left), and the smoke is fading, but still there. I really like smoke as part of the flavor profile, not overpowering. 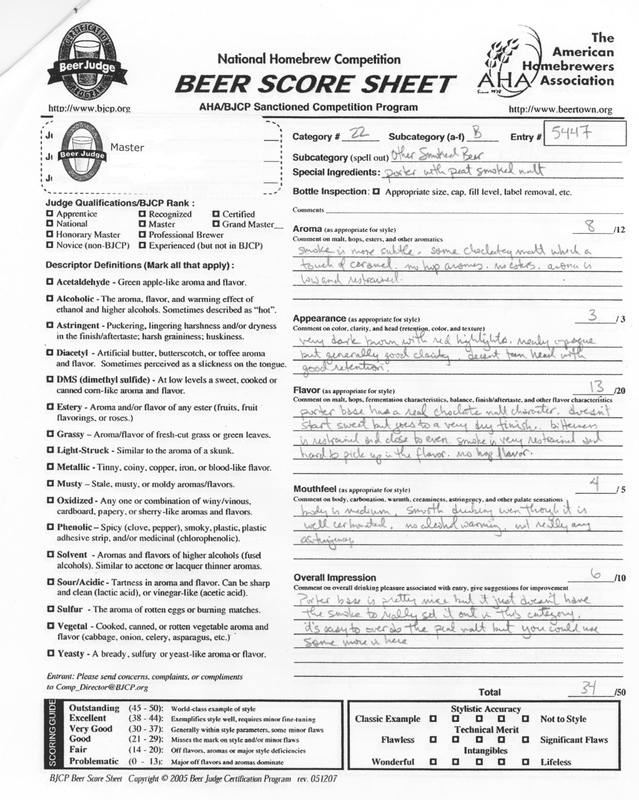 I did enter this beer into a competition, my first one, and I learned a valuable lesson. Go big in your style. A smoked beer should be really smokey, not a hint of smoke, which was my intent. It sounds like I would have rated better entering it as a robust porter, but hey, I am happy with the beer, and would definitely brew it again. I would probably swap out the brown malt (I had it on hand from another brew) for some crystal to up the malty/sweetness, but I like the smoke right where it is, which was the key part to this recipe.